This year December is treating Rome very well indeed. It has been largely dry, as warm as one can hope for, and the rich blue sky sets everything off wonderfully. On Monday I took myself off to the Palatine Hill for a wander amid the ruins in the winter sun to keep track of the never-ending restoration/shoring up work which is constantly underway. This means that the areas one can visit with clients are always changing, and I live in fear of that embarrassing moment where one promises a gem only to find a fence bearing the legend lavori in corso uncompromisingly blocking the way. Despite these complications the Palatine is always lovely, and more than large enough for the work not to impinge on your visit. Even in the treacherous heat of July, when the area around the Colosseum is heaving with uncomfortable but valiant visitors, it is an oasis of calm. It is often all but deserted, full of trees which are both picturesque and shady, and abundantly provided with cool drinking fountains. Not to mention the least unpleasant loo of the whole Colosseum/Forum/Palatine archeological site. 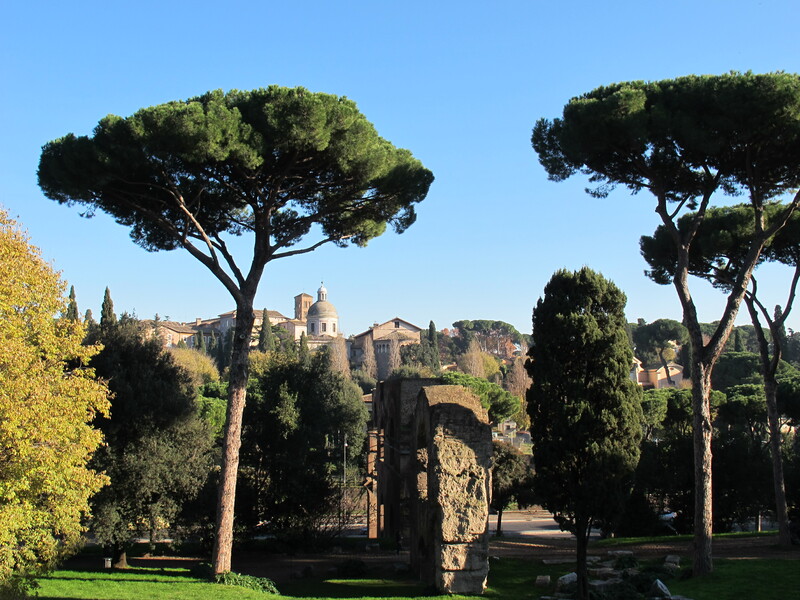 view from the Palatine Hill across to the Caelian Hill. The church of Saints John and Paul in the distance, the remains of a branch of the Aqua Claudia in the foreground. 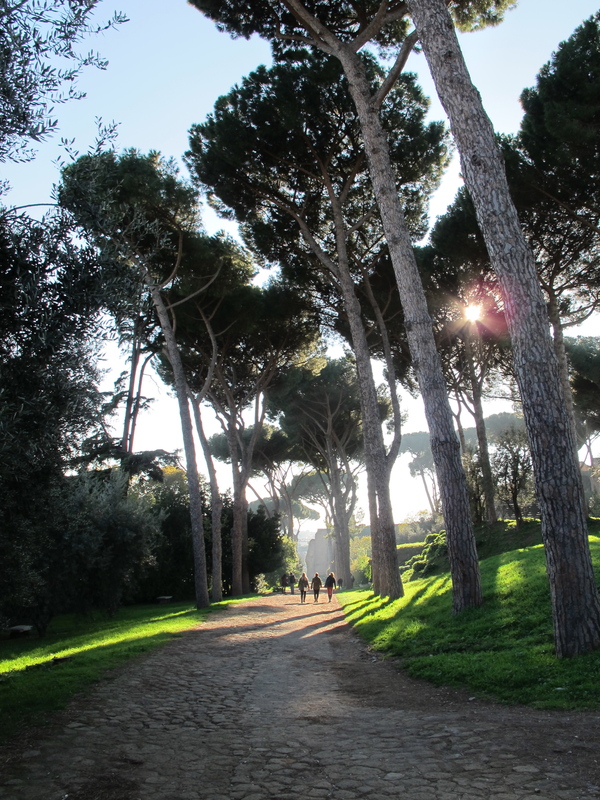 The tallest of the seven hills on which Rome was founded, the Palatine can be said to be the very heart of the city. It was here, legend tells us, that Romulus founded Rome on the 21st April, 753 BC. Which is a splendidly specific date for a legend. Over seven hundred years later it was here that Augustus would build his, initially fairly modest, residence, exploiting geography to cement his role as the new Romulus. What had, during the Republic, been the smart part of town would become the Imperial residence. Indeed the very name of the hill would become synonymous with a royal seat, giving us the word palace. 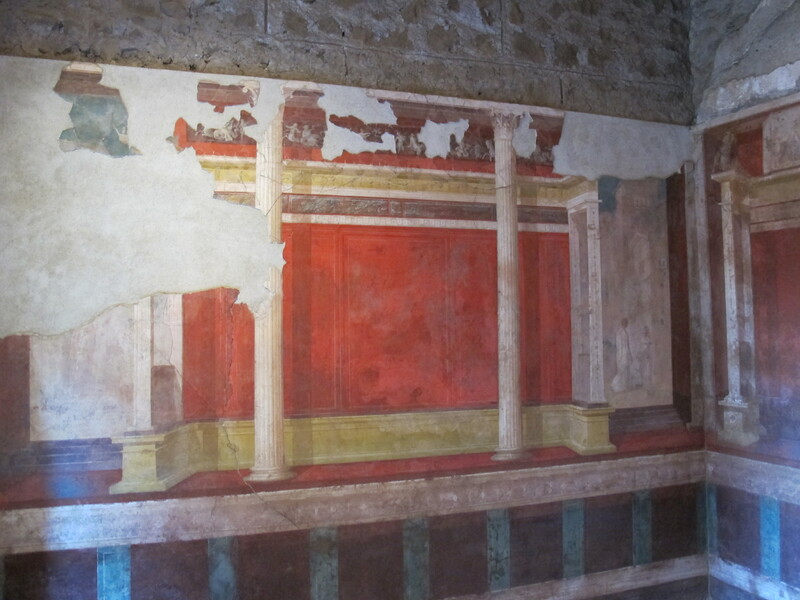 Frescoes at the House of Augustus, Palatine Hill. Following Augustus, subsequent emperors would continue the expansion of the imperial palace, until it occupied all twenty-five acres of the hill. When the western Roman Empire collapsed five hundred years after Augustus, the opulent decoration of the state halls and courtyards, once richly adorned with gilded bronze statuary and with coloured marbles and granites from the the far reaches of the Empire, began to be looted. The once vast population of the city, a million people at the time of Augustus, would by the year 800 (three-hundred years after the last emperor was deposed) number barely twenty-thousand souls. The hill which had once been the seat of an empire which governed from the Atlantic to Iraq would become the very edge of the medieval city, and a series of fortified monasteries, built against the walls of the Imperial palace grew up on the hill. View of fortifications on the Palatine in the Codex of Saint George (early 14th century). Biblioteca Vaticana. Its history and its position towards the Lateran saw it retain a political and military significance throughout the early Middle Ages. However, following the return of the papacy from Avignon in the early 1400s, and the subsequent and definitive establishment of the papal residence across the river at the Vatican, the Palatine was all but abandoned; little more than a quarry for spare parts. 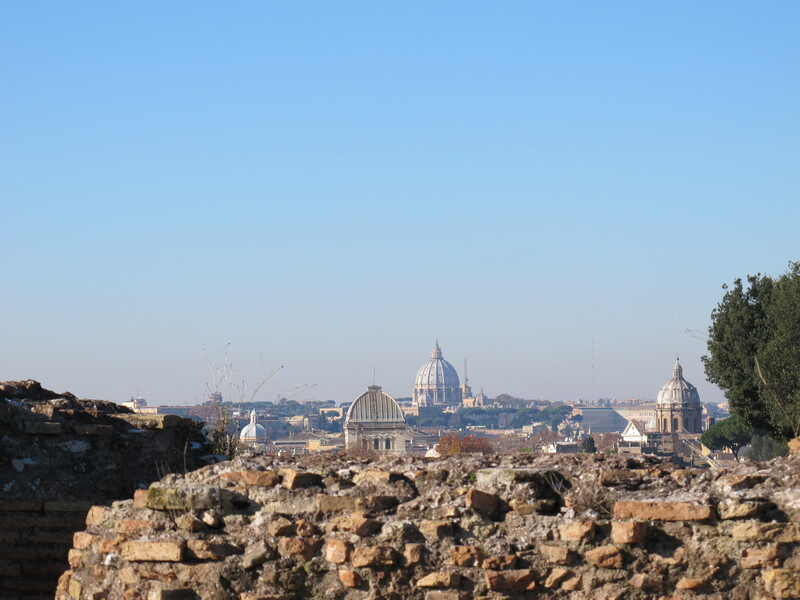 Today the Palatine affords a rather poetic view across to the dome of St Peter’s; the dome of the church rising in the distance is framed by the ruins of the Imperial palace in the foreground. That was built from this; the city of the emperors quite literally became the city of the popes. 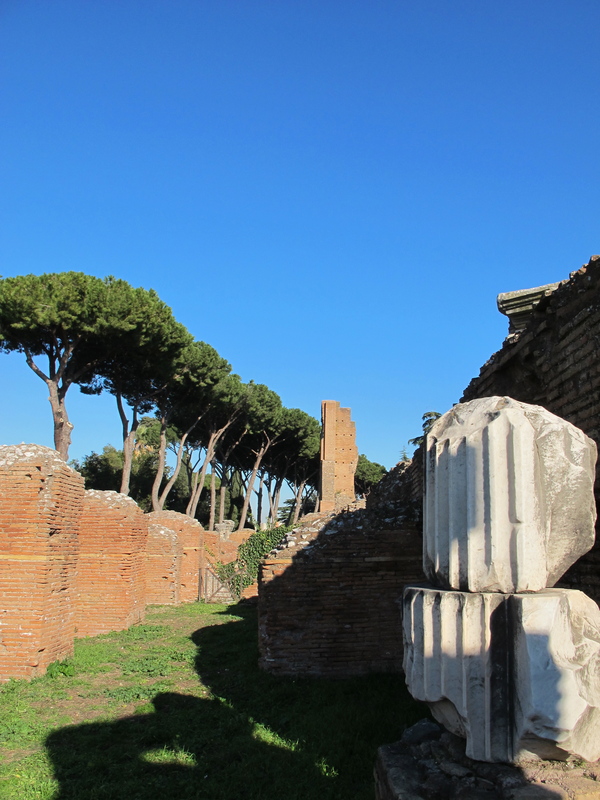 The Palatine Hill is part of my Heart of Ancient Rome itinerary. Personally the Palatine impressed me the most during my 2 days visit to Rome. What is astonishing it is its mystery. We see absolutely monumental ruins, arches – relics of power which ruled the world and we do not know in so many cases what are we looking at. For exampe -ascending the hill we pass by the huge structure which is believed a part of a collapsed to the basement cellars sanctuary, dedicated to unknown god. The reason of this lost knowledge what exactly stod at this or that place is well described by the Author. The precise location and names of the structures was forgotten with the radical depopulation of the Eternal Town. Of course the archeologists every year give us clues and new explanations, but this is a work for generations. But, why not ? It is so pittoresque and impressive location to work….